On the night of October 31, eight days before she was to reach home for Diwali, Anjali Anand scribbled these lines on a sheet of paper before hanging herself from the window of her hostel room at Rajiv Gandhi Nagar in Kota. This 18-year-old had arrived here just 18 months ago after her Class 12 from Moradabad to become one among the 77,000 students at Allen Career Institute and chase her dream of cracking the medical entrance examination. She wasn’t alone — that same day, another 16-year-old Harshdeep Kaur committed suicide at Jaishree Vihar in Kota. She was staying with her family and had dropped out of her coaching classes in May. 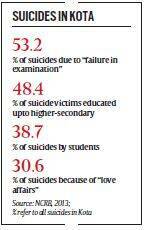 Kota police records show that 24 students committed suicide in 2015 so far — more than double of last year’s 11. In most cases, they cited “study pressure” for ending their lives. Investigating the deaths, The Indian Express accessed police records and interviewed over 50 stakeholders, including students, institute representatives, parents and doctors, to find how Kota, the famed national coaching hub, has become a veritable factory which grinds 24 by 7 in crammed shop-floors where students are treated as little more than raw material. A four-part investigation will show how over 300 institutes — Allen, Resonance, Bansal, Vibrant, Career Point being the big five — promise the world to lure over 1.5 lakh aspirants for engineering and medical seats. And then put them in a system where the cost of failure, as in the case of Anjali Anand, can be shame, fear — and death. Her parents, 49-year-old M K Sagar, an insurance administration officer and his wife Rajkumari, 42, are struggling to cope with the pain, anguish and a “deep sense of guilt”. “I killed my daughter, I gave into her demand of studying in Kota,” said Rajkumari as she broke down in their small, two-room rented house at Railway Harthala Colony in Moradabad. Fighting back tears, Sagar said: “When I saw her body in the mortuary, I just wanted to shake her, wake her up and bring her back to Moradabad,” he said. “When she failed to crack the pre-medical exam in the first attempt after dropping a year, we took her to Meerut for coaching, but she was adamant on returning to Kota,” he added. For Sagar, it was always about giving his children all the opportunities he could. “I get a monthly salary and knew I couldn’t put Anjali in a private college where I had to pay a fee of Rs 50 lakh. Kota seemed like a good option,” said Sagar, adding that he travels over 100 km to Najibabad every day for work. Apart from the Rs-1 lakh tuition fees, Sagar used to send his daughter Rs 13,000 each month for room and board. Anjali’s decision to study in Kota brought about major changes in the Sagar household. “This was the first time she was living on her her own, 700 km away from home. I had never travelled alone in my life but for her sake, I began making trips to Kota,” said her mother. “Anjali gave me the confidence. Once when she was travelling alone, she told me tension mat lo, agar goonde aaye toh ek-do ko toh mai khud handle kar loongi (if goons attack me, I can tackle a couple of them on my own)’,” she added. On the day The Indian Express visited Sakshi hostel, where Anjali lived, the front facade was draped in dark green cloth. The hostel is, in fact, a private residence housing 30 students. A carton full of Anjali’s books and other belongings lay in the courtyard. “After Anjali’s death, five of the girls left. We are planning to shift the hostel now,” said Rajesh Khanna, the manager. What kind of pressure was Anjali under? “What pressure? She insisted on coming here on her own,” said hostel warden Bhavna Rathore who discovered the body on November 1. “She studied but not as much as the other girls here.” Her hostel friends, who Anjali’s family say shared great “camaraderie” with her, don’t wish to talk about her. “We didn’t know Anjali, we concentrate on our studies,” is the refrain. Rajkumari claimed that “a few days before her death”, Anjali had been counselling her former roommate, who had been preparing for the AIIMS exam for the last three years, against committing suicide. The roommate declined to speak to The Indian Express. “I spoke to her former roommate a few days ago and she said Anjali was counselling her against committing suicide. It was on Anjali’s insistence that she gave up that idea, now how can my daughter end her own life?” said Rajkumari. The family of Harshdeep Kaur, the other student who committed suicide the same day as Anjali, was not available for comment. But in Ghaziabad, over 140 km away from Anjali’s Moradabad, the distress of her family echoed in another home. “Mummy, mein bahut pressure mein tha. Sabhi bolte hai ki 70% se kam nahi aana chahiye. Papa ke paise waste nahi karna chahta (I am under a lot of pressure, everyone says I need to get at least 70 per cent marks, I can’t let Papa’s money go waste)”. These were Sarthak Yadav’s last words before the 17-year-old hanged himself in his maternal grandparents’ house in Talwandi area of Kota on June 7. Just like Anjali’s mother, Mamata, Sarthak’s mother, breaks down. “It has been a dark Diwali for us. My son was supposed to come home during this time, these festivals hold no meaning for us any longer,” she said. A Class 11 student, Sarthak was also a student of Allen Career Institute and preparing for the pre-medical test, while completing his education from a local school. Sarthak’s family, originally from Saharanpur in UP, now lives in rented accommodation in Ghaziabad. His father, a police constable, says he put together the money for the admission in Kota with great difficulty, but the family claims they never put any kind of pressure on their child. “We just wanted him to do well, he had been in Kota for barely two months, I still cannot believe my little boy has committed suicide,” said Mamata. In Kota, Mamata chose to put her son up with Dinesh Yadav, his maternal grandfather, who works in the administration department of Allen Career Institute. They thought it would be the “best option” for their child who was staying away from home for the first time. “I found him hanging from the ceiling with a gamchha (towel). I couldn’t believe that such a young child had taken such an extreme step,” said Dinesh Yadav, who has five students preparing for different entrance tests, mostly relatives, staying as paying guests in his home. “He was a good student, but he barely stayed here for anybody to gauge his capabilities,” he added. Mamata, too, didn’t see any signs of danger before Sarthak ended his life. “I spoke to him regularly, he was a little weak in his studies but was trying to cope up,” she said. Dinesh Yadav said institutes do “everything to keep the students motivated”, but it is the “child’s own emotional weakness that could plunge him into a dark zone”. When contacted, C R Chaudhury, Senior Vice-President of Allen Career Institute, blamed parents for the burden of expectations they place on their children. Chaudhury also listed various measures taken by coaching institutes to help students. “Pressure is the biggest issue for these deaths, but parents are most responsible in these cases. We have taken a number of steps to ensure that students get an outlet. There are motivational lectures, there is a suicide helpline, our magazines have motivational stories. We are also trying to track students who feel they are mentally exhausted. There are more cases reported from our institute, because we have the largest number of students,” said Chaudhury. Back at Anjali’s home in Moradabad, Rajkumari had started unpacking one of her daughter’s bags. The Sagars say they will visit Kota again — this time to find out what drove her daughter to death.